Maricel has prepared a delicious breakfast again, this time there is a big pancake with a special nuts and grains flour mix, very tasty. Dragana organizes transport passes for everyone, and leaves for a meeting at Dell while we head to the park with the three kids. It’s an amazing park really! 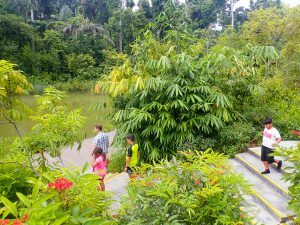 We discover a canopy boardwalk, and Skye gets the kids to start looking for birds promising extra satays at lunch for those pointing new specimens. And sure enough we get to see some new birds, including the Singaporean national bird, the crimson sunbird. From the marsh path to the jungle path, along waterfalls, ponds with giant lilies, we are in awe of the work done here, everything is exquisite. We manage to enter the orchid garden after finding a way to get cash at the souvenir shop to pay the entrance were you can’t pay by credit cards. Here you can see a staggering variety of orchid hybrids, some are created for celebrities. Last night Dragana walked us to the scientific facilities, we got to see a lab were flower tissues are swirled in test tubes. After a full morning in this tamed pocked of nature, we take the MRT back to the apartment to regroup with Dragana who was pleased with her meeting. 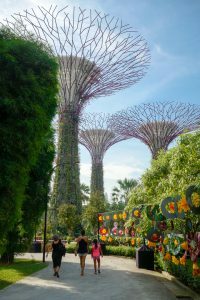 A Uber takes us to Satay by the Bay, a hawkers food center in the Gardens by the Bay, a fantastic futuristic garden. 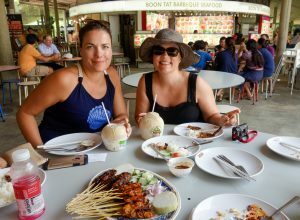 We refuel with scrumptious street food: chicken and beef satay with rich peanut sauce, coin pratas, rice chicken, popiah… the place is relatively quiet as it is a week-day, but it can be very packed. Hawker centers do not have napkins, but they have sinks were you can wash your hands. 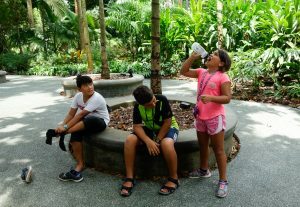 We discover the kids garden, complete with splash park, in which we adults can’t go, although with the heat, it is very tempting. Then Dragana takes us to the Cloud Forest dome, it’s an impressive free-standing glass structure containing tall artificial hill covered in a vertical garden of a wild variety of foliage and flowers, with suspended bridges and walkways spiraling down the dome. 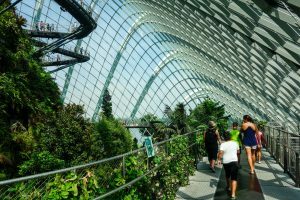 You climb with a lift and visit the different levels of the construction and at the same time you discover a fantastic view of the gardens complete with the iconic Marina Bay Hotel and Supertree Grove. Sandra is super happy to finally get to see these ginormous steel trees which she finds particularly attractive. Next to the Cloud forest dome is the Flower dome boasting dryer climate plants like baobab, succulents and cactus trees as well as some Mediterranean plants including some amazingly high olive trees. With Halloween coming up, there is a spectacular display of pumpkins. 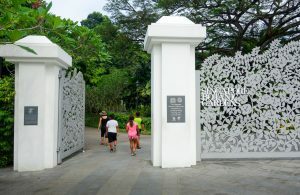 Next stop is a lookout at the foot of the Marina Bay to embrace a panoramic view of the garden and the Supertree Grove. We have to go across one of the Marina Bay hotel towers. On the flyover path overlooking the gigantic Lobby, Dragana explains that the guard sitting there is new. Skye asks the man why he is on duty here. He confirms that he is here to avoid suicidal people messing up the posh restaurant below. 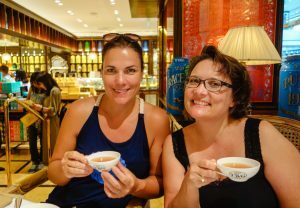 We are not ready to throw ourselves off the bridge, not when we are about to have tea at TWG! The gorgeous tearoom is located in the very posh Marina Bay Sands shopping mall. After sharing fine tea infused patisseries and macaroon, and sampling fragrant teas, we carry on our visit of the marina across which we see the historic Merlion statue, and a backdrop of skyscrapers complete with some architecturally interesting buildings such as the Helix bridge and the ArtScience Museum shaped like a Lotus resting on a basin in the shape of a lotus pad. The sun is strating to set so the light on the skyline is beautiful. We take the MRT back to the apartment to meet up with Arash and change for a much debated restaurant dinner, indeed the choices of restaurants in Singapore is Cornelian. To Luka’s delight, we go for crabs at Jumbos’. We pile up in a Uber to get to Dempsey Hill. Dinner is a lot of fun and really delicious. 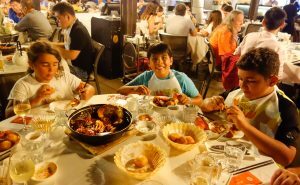 Eating those crabs is a messy business, but it’s hilarious too, and everyone is thoroughly enjoying the experience as we polish the food with gusto and a lot of little buns! Dragana then calls a Uber to send the kids back home while we finish the wine and beer. In no time, a Mercedes Class A pulls over for our babies who leave the restaurant in style, all proud to go home on their own. Reception is soon confirmed by Maricel. It’s been a while since the Legons have done a urban outing without kids. 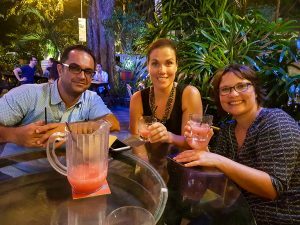 Our friends take us to Lanterns, an elegant hotel bar facing the Marina Bay, and we get to sample the city’s signature cocktail: the Singapore Sling created sometimes around 1915 by a bartender at the Raffles Hotel. A taxi takes us for a night shot of the Supertree Grove at our previous lookout and we take another taxi to go to Little India for a pitcher of strawberry margarita in a colorful and busy side street. On our way back home we go through Arab street and see the big shopping complex Mustafa Center, Alibaba.com in brick and mortar. Arash and Skye even manage to have Japanese whiskey back at the apartment. It’s been a great day in a very singular city that has the magic of a Disneyland and for grownups!